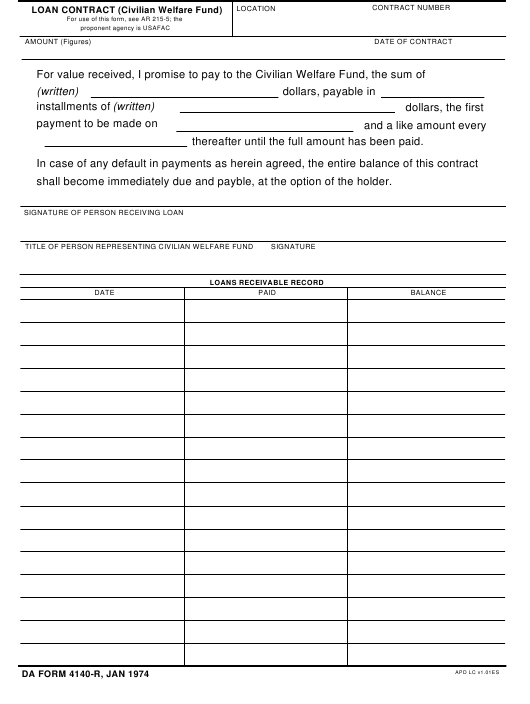 DA Form 4140-r or the "Loan Contract (civilian Welfare Fund)" is a Department of the Army-issued form used by and within the United States Military. The form - often incorrectly referred to as the DD form 4140-r - was last revised on January 1, 1974. Download an up-to-date fillable DA Form 4140-r down below in PDF-format or look it up on the Army Publishing Directorate website. thereafter until the full amount has been paid. shall become immediately due and payble, at the option of the holder.